As many as 100 million malaria cases could be prevented annually and 200,000 lives saved with a new vaccine, according to a study by a British firm. Pharmaceutical giant GlaxoSmithKline (GSK) issued results saying the RTS,S malaria vaccine protected young children and babies from malaria up to 18 months after vaccination. And it could have a massive impact on public health, especially in sub-Saharan Africa, said Eleanor Riley, professor of immunology at the London School of Hygiene and Tropical Medicine. Now the vaccine could be less than two years off as GSK plans to apply to European regulators for approval. In the meantime, people heading to such regions on holiday are reminded of the importance of taking out medical travel insurance. The vaccine was shown over 18 months to nearly halve the amount of malaria cases in children aged five to 17 months. 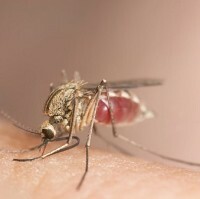 The vaccine was found to have lowered malaria cases in babies aged six to 12 weeks with the first jab by roughly 25%. There were three doses a month apart for the youngsters and their immunity to malaria in follow-up dropped, Professor Riley saying those doses delivered 30-50% protection. A sample of the youngsters received a booster jab and experts are waiting to see if the booster gave extended protection. The professor said if all at-risk children were vaccinated, 200,000 lives per year could be saved around the world, and 100 million cases per year around the world could be prevented, mainly sub-Saharan. The vaccine triggers the immune system to defend against the malaria parasite and is designed to prevent it from infecting, maturing and multiplying in the liver. Professor Sir Brian Greenwood, from the London School of Hygiene and Tropical Medicine, who is an investigator on the trial, said: "Results show that the malaria vaccine RTS,S/AS01 continues to protect vaccinated children during an 18 month follow-up period."